The story of a late thirty-something graphic designer grieving the passing of his father who recently came out of the closet as being gay, in indie film circles, is one of the most adored films of the year - a critique which might just illicit some angered responses from the devoted fan base. With only a slight narrative to hold on to, the ambling tone and seemingly improvised quirkiness compares to the cinema of Sofia Coppola. It’s heart-on-your-sleeve filmmaking, with unnecessary stylistic idiosyncrasies, that unfortunately wears out its welcome. There's not much of a story here, but to make up for it director Mike Mills splits his running time between three periods - the present, which has the designer, Oliver (McGregor), during his grieving period finding true love with a whimsical French gal (Laurent); the immediate past with his dying father (Plummer) still living out his new gay life like an energized teenager; and Oliver's oddball childhood and the relationship with his artsy mother. None of these periods seem like the present, past or future, instead a revolving door of time, the combination of which forms the slice of Mills' own life. Most of the dialogue feels completely unnecessary to tell this story. Instead, it becomes just part of the background sound as important as the street noise, the eccentric jazzy piano score and McGregor's intermittent and random voiceover ramblings. The deadpan stylish flourishes, such as the subtitle musings of Oliver's dog, I could live without. Same with the use of Oliver's scratchy drawings shot in close-up with a jump-cut montage effect, or the idiosyncratic editing, or the annoying faux-profound pronouncements, which seem more at home in a Levi's or Microsoft ad than in this film. The gentle tenderness thus morphs into some kind of grand lesson of life, which never really connects to the emotional core of Oliver's experiences. 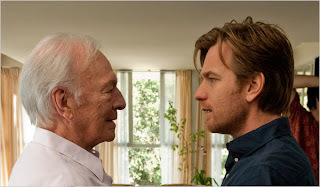 Cherish Beginners for Christopher Plummer's youthful performance as an old man in the midst of his sexual liberation. Everything else is window dressing. Beginners is available on Blu-ray and DVD from Alliance Films in Canada.